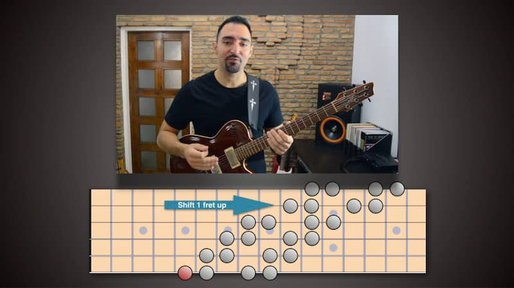 In this lesson excerpt from SFS Pentatonics 2 - Navigating Chord Changes, we learn about different harmonic contexts over which we can improvise using the Half / Whole Diminished Scale. We also look at a modified, "half diminished" version of the minor pentatonic scale that we can use over m7b5 chords. Note: If you don’t know how to play the Half / Whole Diminished scale everywhere on the fretboard, then you should first check out the previous lesson, called “Instant Diminished Scale”, for a very quick way to do that, using the SFS fretboard organization system. The most obvious application of the Half-Whole Diminished scale is when you see a diminished triad, a simple diminished chord. (Btw, in this lesson we are going to always use the half-whole version of the scale, not the whole-half). Watch the video to hear how that sounds. There is a chance that the Half-Whole diminished might not be the most conventional and traditionally appropriate choice. This depends on harmonic context. Sometimes the Whole-Half might be more appropriate, or even something totally different like the Locrian mode, or the Superlocrian, or the Ultralocrian. But we can't cover all these scales in one lesson, and the truth is that whenever you have a high tension chord, like the diminished, or an altered 7th chord, the listener’s ears are more receptive to more “outside” sounds. In fact, in jazz and fusion, and some other styles, players do this on purpose all the time. They substitute the more conventional scale choice with an “outside” substitution. So if it happens that the Half-Whole diminished scale sounds a bit "off" over a certain diminished chord, don’t worry about it, use it anyway. The trick when playing “out” is to play confidently so that the sound of the scale becomes more prominent than the sound of the harmonic context, and pulls the listener into following your melodic idea. Another important thing is to resolve the tension by voice-leading smoothly into the target chord that comes next. I play you an example of this in the video as well. Another use for the H/W Diminished Scale is over the diminished 7th chord. That’s the one you practiced over in the last lesson, so it should be familiar. You can hear this in action over chord changes in the video. Another place for the Half-Whole Diminished scale is when you see a dominant 7 flat 9 chord. This is one of those places where again you will most likely get a slightly “outside” sound, but again the use of this scale is very standard and should work fine. For a shortcut it certainly beats having to learn all the theory in order to decide if you should use a Phrygian Dominant, or the altered dominant, or some other scale. You can always learn those as well, but what we are after here is to equip you with a basic toolbox to handle all chords in a short time. Later you can add new colors and choices on top of this. In the video I play you an example over the following chord progression: Dm7b5, G7b9, and then Cm for 2 bars. According to what we learned in this course, I play the modified 3 string pentatonic for Dm7b5, the H/W Diminished for G7b9, and then the C minor pentatonic for Cm. I improvise and try to voice-lead smoothly from one scale to the next. This way you can hear how the tension of the “outside sound” of the H/W diminished resolves when I voice-lead into the C minor. So watch the example paying attention to the scale changes, and have fun practicing this scale yourself.